A small group of elephants at a waterhole close to the Okavango river (and not far from our basis). Angolan farmers try to protect their fields with glas bottles from the invasion of the elephants. MgM-Basis in Jamba: From here we are organising the demining projects for the KAZA park. One of the largest nature conservation areas is developing in Africa – and MgM is in the midst of it all. 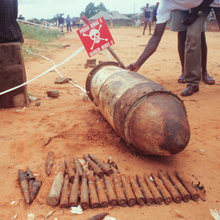 We have already repeatedly informed about our efforts to demine the heavily mined, huge area of Kuando Kubango in Angola’s southeast. In October 2010 we finally received the necessary funding from the EU, probably also motivated by the recent planning of the KAZA Park, the largest nature conservation park worldwide, whose development is being followed with great social and political interest. The Kavango-Zambesi-Transfrontier Park includes areas of Namibia, Botswana, Zambia, Zimbabwe and Angola – a unique conservancy the size of Italy is developing. Main aim of the KAZA Park and the reason why the initiative is so unique, is the integration of the rural population into the park including communities from former conflict areas for example Zimbabwe and Angola, an idea formulated by the WWF twenty years ago. One of the aims is to create a conservancy which can solve the Africa-specific difficulties of the human-wildlife conflicts. Presently the rural communities of southern Africa hardly benefit from the fascinating diversity of African wildlife. On the contrary: elephants are destroying the fields, lion and leopard are killing the life stock, hippos are killing several dozen people annually and rhinos are only of interest to poachers. The only way to protect these animals is if the local population can profit from them. The solution is tourism. Statistics show that for every 7-8 tourists one job is created and sustained. Such a job can feed a whole family in southern Africa. In order to guarantee a continuous influx of visitors, certain safety standards have to be provided and that is where we come in, as it is highly unlikely that tourists will travel into a heavily mined area. So our goal is to clear Kuando Kubango of landmines by the end of 2013. To be able to go through with this we had to move or main base including the K-9 unit from Xangongo 650 km to the east to Jamba, into the heart of the Angolan area of KAZA at the beginning of 2011. After a refreshment course for our demining experts, which had to take place in between to operations, due to insurance reasons, we were able to start with the demining on the 17 February. For now we are concentrating on clearing the access road to Jamba with our mine detection dogs and armour-plated vehicles and to make the road fit for traffic again with the help of road construction vehicles. During the first month of this mission we were able to clear 52 kilometres of road and an area of 7.000 m². We have found 66 anti-personnel and anti-tank mines as 66 UXOs (old ammunition and duds). After having cleared all roads in the area we will start demining the numerous landmine fields around Jamba, which have been placed here by the UNITA leader Savimbi (see info above), who had a secret military basis here. 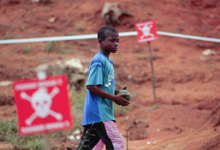 We assume that we will have completely demined the area around Jamba by the end of 2011 and that we can then concentrate on other areas of the Angolan KAZA area. At the end Kuando Kubango will be mine free and with that we hope to give the population of this beautiful province the opportunity to a better future.